Exactly 12 Years ago this week, NASA’s now famous Spirit rover touched down on the Red Planet, starting a spectacular years long campaign of then unimaginable science adventures that ended up revolutionizing our understanding of Mars due to her totally unexpected longevity. With a newly cleared memory, it’s time for Opportunity to resume the next stage of its long, long Martian drive. The next major goal for the long-lived rover is to go to Marathon Valley, a spot that (in images from orbit) appears to have clay minerals on site. Clay tends to form in the presence of water, so examining the region could provide more information about Mars’ wet, ancient past. The rover has driven further on Mars than any other human-made machine; as of Sept. 9, it had reached 25.28 miles (40.69 kilometers). But signs of age are showing as the rover moves through its 11th Earth year on Mars. NASA recently halted science operations for a few days to reformat the rover’s Flash memory, which was causing several reboots. The remote repair worked perfectly and the rover is ready to resume work, NASA said in an update Sept. 12. Ready to roll: the Opportunity rover’s wheels and tracks are visible in this picture taken on Mars on Sol 3,783 in September 2014. Credit: NASA/JPL-Caltech/Cornell Univ./Arizona State Univ. The major goal of Opportunity’s latest extended mission, the review continued, is to find out what habitability conditions existed on Mars. This includes looking at the water, the geology and the environment. “This will be achieved by measurements of rocks and soils, as well as atmospheric observations, as it traverses from Murray Ridge to Cape Tribulation,” the report read. A still from the Opportunity rover’s navigation camera taken on Sol 3,783 in September 2014. At bottom is part of the solar panel cells used to power the Martian rover. Credit: NASA/JPL-Caltech/Cornell Univ./Arizona State Univ. The report further cautioned that there is no proof yet that the phyllosilicates (which are sheet salt silicate materials made of silicon and oxygen) are from the Noachian era, which represents geology that is more than 3.5 billion years old (depending on which source you consult). It added, however, that Opportunity is expected to be able to complete the science. Meanwhile, enjoy these pictures from the rim of Endeavour Crater that Opportunity sent in the past few days. Rocks scattered across the Martian vista in this picture captured by the Opportunity rover on Sol 3,783. Credit: NASA/JPL-Caltech/Cornell Univ./Arizona State Univ. Two of Opportunity’s six wheels are visible in this shot from the rear hazcam on Sol 3,780, taken on Mars in September 2014. Credit: NASA/JPL-Caltech/Cornell Univ./Arizona State Univ. Tracks from Opportunity stretch across this vista taken by the rover on Sol 3,781 in September 2014. Credit: NASA/JPL-Caltech/Cornell Univ./Arizona State Univ. In fantastic news for the long-running Opportunity mission on Mars, NASA says the rover’s much-needed memory reset worked out perfectly. The rover was unable to perform science or beam pictures back to Earth because portions of its flash memory — which can store information even when the rover is turned off — were beginning to wear out. The reboot means the rover is soon going to be on the move again as it continues exploring the rim of Endeavour Crater, tacking on nearly a marathon of miles that Opportunity has racked up on Mars since 2004. After performing related activities to the reformat on Sept. 6 and 7, controllers tried to take Opportunity out for a drive. They decided to stop shortly after beginning on Sept. 9 because the visual odometry Opportunity was using wasn’t enough for navigation. The controllers plan to try it again, using different landmarks next time. Current odometer on the rover: 25.28 miles (40.69 kilometers). Opportunity, however, is facing funding challenges on Earth as NASA and its political stakeholders weigh which of the agency’s long-term missions should continue. NASA’s Opportunity rover, which has been roaming Mars for more than 10 Earth years, requires a flash memory reformat to keep doing science on the Red Planet, the agency wrote in an update Aug. 29 along with its intentions for making that possible quickly. The agency has experience in doing this procedure as they successfully ran it on the twin Spirit rover five years ago, before the rover got stuck in sand and died. A separate update on the Jet Propulsion Laboratory website noted there have been more than a dozen incidents on Opportunity in the past month, and it takes a day or two to recover from each one. Flash memory, the update added, is useful because data remains on the rover even if it is turned off. But after 10 years of using the cells on Opportunity’s flash memory, the agency suspects that these cells are starting to wear out. “Reformatting clears the memory while identifying bad cells and flagging them to be avoided,” the update read. “The flash reformatting is a low-risk process, as critical sequences and flight software are stored elsewhere in other non-volatile memory on the rover,” stated JPL’s John Callas, project manager for NASA’s Mars Exploration Rover Project. Opportunity is currently circling the ring of Endeavour crater and is in otherwise excellent health, NASA said. The rover has driven 25.28 miles (40.69 kilometers) since arriving on Mars in January 2004 for what was supposed to be a 90-day mission. NASA’s incredibly long lived Opportunity rover has driven to the ridgeline of a Martian mountain and captured spectacular panoramic vistas peering down into the vast expanse of huge Endeavour crater and out along the jagged rim segments leading to her next target – which scientists believe holds minerals indicative of a habitable zone. See mosaic views above and below. Since departing the world famous ‘Jelly Doughnut’ rock by the summit of ‘Solander Point’ in February, Opportunity has spent the past several months driving south and exploring intriguing rock outcrops on ‘Murray Ridge’ located along the eroded western rim of Endeavour Crater. The renowned robot is now exploring a region of outcrops atop the rims ridge that’s a possible site harboring deposits of hydrated clay minerals, formed in the ancient past when Mars was warmer and wetter. The ten year old Red Planet rover first reached the rim of Endeavour Crater in August 2011. She has captured numerous sweeping gorgeous vistas during her first of its kind expedition on the surface of another planet by an alien probe from Earth. Read my earlier story detailing the top 10 discoveries from twin sisters Spirit and Opportunity according to Deputy Principal Investigator Prof. Ray Arvidson – here. So there is endless enthralling terrain to investigate – for at least another 10 years! The floor of Endeavour crater is filled with dark sand, brighter dust, and, in the distance, dusty haze, says NASA. This vista of the Endeavour Crater rim was acquired by NASA’s Mars Exploration Rover Opportunity’s panoramic camera on April 18, 2014, from the southern end of “Murray Ridge” on the western rim of the crater. In mid-May, the rover approached the dark outcrops on the flank of the hill at right. The high peak in the distance on the right is informally named “Cape Tribulation” and is about 1.2 miles (2 kilometers) to the south of Opportunity’s position when this view was recorded Credit: NASA/JPL-Caltech/Cornell Univ./Arizona State Univ. Opportunity’s goal all the while has been to doggedly trek southwards towards exposures of aluminum-rich clays detected from orbit by NASA’s powerful Martian ‘Spysat’ – the Mars Reconnaissance Orbiter (MRO) – while gathering context data at rock outcrops at Murray Ridge along the winding way. These aluminum-rich clay minerals, or phyllosilicates, likely formed billions of years ago in flowing liquid neutral water which is more conducive to life, compared to more acidic environments explored earlier in the mission, and is therefore potentially indicative of a Martian habitable zone and a scientific goldmine. The science and engineering team has used the high resolution MRO spectral and imaging data to more efficiently direct Opportunity southwards along the Endeavour crater rim and towards the biggest caches of the clay minerals – which were detected at a mountainous rim segment called ‘Cape Tribulation’ and which is seen in the panoramic vistas. Although Cape Tribulation still lies some 1.2 miles (2 kilometers) further south, the rover has just arrived at a region which the team believes shows the first signatures of the clay minerals. “The rover is exploring the region of aluminum-hydroxyl clay minerals seen from orbit,” said NASA in a mission update. The six wheeled robot will utilize her mast mounted cameras and arm mounted microscopic imager (MI) and APXS spectrometer to gather images and measurements to unlock the mysteries of Mars ability to support life – past or present. “The more we explore Mars, the more interesting it becomes. These latest findings present yet another kind of gift that just happens to coincide with Opportunity’s 10th anniversary on Mars,” said Michael Meyer, lead scientist for NASA’s Mars Exploration Program. 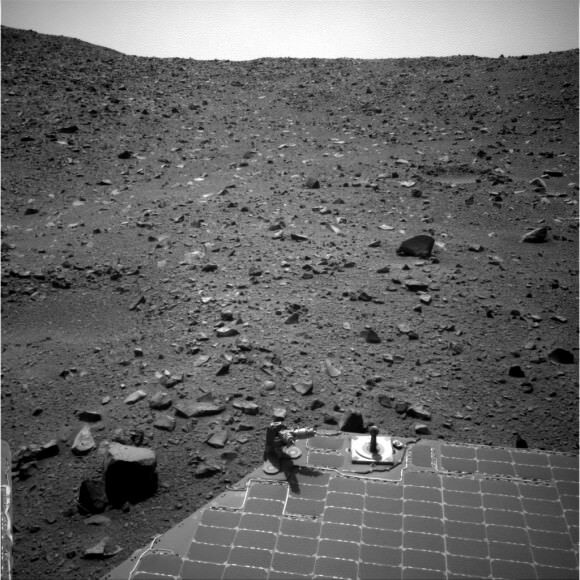 And Opportunity is now power-rich following a series of fortuitous wind cleaning events that substantially cleared the dust off the power generating solar wing arrays. The solar array energy production has reached 761 watt-hours compared to about 900 watt-hours at landing in 2004 and only about 270 watt-hours just before Christmastime in December 2013. “Solar panels [are] cleanest since about sol 1600 [September 2008],” says mission science team member Larry Crumpler. More power means more work time and more bonus science studies and data return. So the robot survived magnificently through her 6th harsh Martian winter with plenty of science rich targets planned ahead during the southern hemisphere Martian spring and summer. Today, May 24, marks Opportunity’s 3673nd Sol or Martian Day roving Mars – compared to a warranty of just 90 Sols. So far she has snapped over 192,600 amazing images on the first overland expedition across the Red Planet. Her total odometry stands at over 24.49 miles (39.41 kilometers) since touchdown on Jan. 24, 2004 at Meridiani Planum. Meanwhile on the opposite side of Mars, Opportunity’s younger sister rover Curiosity is trekking towards gigantic Mount Sharp and just drilled into her 3rd Red Planet rock at Kimberley. NASA’s preliminary (read: not finalized) budget for 2015 would eliminate funding for the long-running Opportunity rover mission that’s discovered extensive evidence of past water on Mars in the past decade. While the agency’s baseline budget request shows no funding for the long-running Mars mission past 2015, NASA added that Opportunity is among several missions that could receive extension money if extra funds become available. Also, the budget needs to be approved by Congress before anything is set in stone. Within NASA, that translates into an extra $885.5 million that would be used for certain priority areas in science, aeronautics, space technology, exploration, space operations, education and other items. If the funding goes through and if it is approved in full, Opportunity could receive money within $35 million allocated in planetary science extended mission funding for 2015. There’s far more context to this than can be provided in a single news story, so we encourage you to check out the 713-page NASA budget request as well as NASA’s full budget documentation. Opportunity landed on Mars in January 2004 and has rolled more than 24 miles (38 kilometers) in the years since, long outliving its twin Spirit (who ceased communications in 2010). Universe Today’s Ken Kremer recently covered the contributions these rovers made to science in the past 10 years. 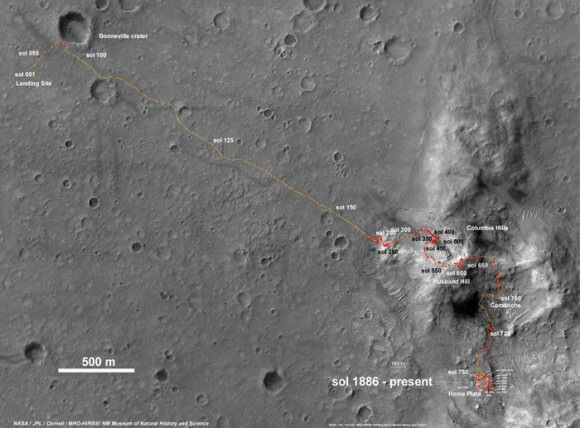 The last Opportunity update on March 4 described how controllers deliberately crushed a rock under the rover’s wheels as it explored Endeavor Crater, where Opportunity has been trundling along since 2011. On May 19th, 2005, NASA’s Mars Exploration Rover Spirit captured this stunning view as the Sun sank below the rim of Gusev crater on Mars. This Panoramic Camera (Pancam) mosaic was taken around 6:07 in the evening of Sol 489. The terrain in the foreground is the rock outcrop “Jibsheet,” a feature that Spirit has been investigating for several weeks (rover tracks are dimly visible leading up to “Jibsheet”). The floor of Gusev crater is visible in the distance, and the Sun is setting behind the wall of Gusev some 80 km (50 miles) in the distance. Today it’s hard to imagine a Mars without Spirit. Jan. 3 marks the 10th anniversary since her touchdown on Mars on Jan. 3, 2004. Her twin sister Opportunity soft landed 3 weeks later on Jan. 24, 2004. So here’s a collection of some of Spirit’s greatest hits on the Red Planet for all to enjoy and remember her fabulous exploits. Read my detailed new overview marking ‘Spirits 10 Years on Mars’ – here – with even more spectacular Red Planet imagery! Since the golf cart sized Spirit snapped over 128,000 raw images, drove 4.8 miles and ground into 15 rock targets we can’t show everything. Here’s a retrospective of some of our favorites. During her more than six year lifetime spanning until March 2010, Spirit discovered compelling evidence that ancient Mars exhibited hydrothermal activity, hot springs and volcanic explosions flowing with water. “Spirit’s big scientific accomplishments are the silica deposits at Home Plate, the carbonates at Comanche, and all the evidence for hydrothermal systems and explosive volcanism, Rover Principal Investigator Steve Squyres of Cornell University, explained to me in an earlier interview. Stay tuned here for Ken’s continuing Mars rover, Curiosity, Chang’e-3, SpaceX, Orbital Sciences, LADEE, MAVEN, MOM and more news.